A. Digital logic circuitry receives a speed signal from the vehicle's CPU to automatically open the tailgate at highway drag inducing speeds, then close before coming to a stop. 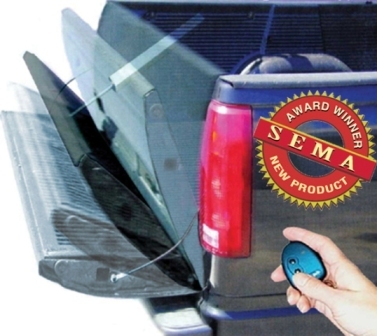 Alternately, the tailgate can be manually controlled to fully open, close, or lock in any position at any time, using a 2-channel RF remote key-fob. Q. Will installing Droptail on my truck improve mileage? A. Our tests show highway mileage improvements between 5 - 10%. Improvements will vary depending on the vehicle, weather and driving habits. Q. How can I get more power? A. Reducing aerodynamic drag frees up available on-road horsepower for better acceleration. Q. How is stability improved? A. When in spoiler mode, a downward force is applied to the rear of the truck improving rear wheel traction, particularly beneficial on slippery or windy roads. Q. How does Droptail prevent tailgate theft? A. The tailgate is difficult to remove in the closed position because the actuator effectively locks the tailgate with 500 pounds closing force. The tailgate must be opened using the RF remote before removal. Q. How does it improve back-up visibility? A. Rearward vision is greatly enhanced by lowering the tailgate (barrier) using the key-fob while driving. A. Bolt-on installation takes about 3 hours with average skill and requires simple hand tools. We provide complete, illustrated installation instructions with each kit, so you can install this product with complete confidence. See Installation Overview. Q. Are there any holes in the dash for switches, buttons or LEDs? A. No, there is no visible in-cab installation. Manual control is accomplished using the remote RF key-fob. Q. Is it rust and water resistant? A. Yes, and all exposed components are plated to resist corrosion. Q. Will it open automatically if there is cargo in the bed? A. No, not if the tailgate was lowered to place items into the bed. Additionally, owner may lock the tailgate in any position manually using the RF remote at any time. Q. Will I lose cargo space? A. Extremely compact offset actuator arm requires only about 1" at bed opening. Q. What happens if the tailgate is obstructed while in motion? A. Current sensing circuit stops the tailgate, then quickly reverses direction under certain conditions, gives warning beeps, and then waits for a manual command. Additionally, there are in circuit replaceable fuses. Q. Will Droptail fit with my bedliner? A. Droptail fits over most spray-on and under-rail models. Some liners may require modification. Q. Can the actuator be color-matched to the truck? A. Yes, individual owners can easily scuff, prime, and paint the actuator, using readily available auto parts store spray cans. Q. Can the tailgate be held open at any position? A. Yes, the tailgate can be opened and stopped at any position, at any time, using the RF remote. Q. Does the system have a weight handicap? A. No, unlike heavy tonneau covers that can weigh as much as 125 pounds or more, our system weighs only four pounds. Q. How difficult is Droptail to remove? A. Once opened, it takes one person seconds to disconnect, unlike most truck caps which require two people and a plan. Q. Is the loading capacity of the fully open tailgate reduced? A. There is no compromise in the load carrying capacity of the tailgate because the original tailgate support cables still carry all the load. Q. Will the tailgate fit the same? A. Yes, complete range of motion is retained, and the truck looks as stock when fully closed. Q. Can I go off-road with it? A. Yes, factory latches are engaged in the closed position, retaining bed rigidity needed when off camber. Q. How is Droptail an advantage for fifth wheel applications? A. Droptail allows for convenient in-cab hook-up and use of the stock tailgate, without having to purchase a separate notched tailgate for towing. Q. How is Droptail an advantage for carrying motor-sports equipment? A. Tailgate can be snugged up against partly extended motor-sport tires for added cargo security.